Image caption "They'll stop at nothing," the Pegida group wrote. "Can you really buy these? Or is it a joke?" Members of the anti-Islam protest group Pegida in Germany have complained about images of non-white children on Kinder chocolate bar packets. A Pegida Facebook page in Baden-Wuerttemberg asked: "Is this a joke?" But after being told the photos were childhood photos of Germany's footballers being used in Euro-2016-linked marketing, they admitted they had "dived into a wasps' nest". Kinder said it would not tolerate "xenophobia or discrimination". 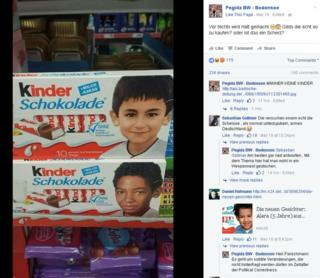 A photograph of two chocolate bars was circulated by the person behind the Bodensee Facebook group of Pegida (Patriotic Europeans Against the Islamisation of the West). For decades, Kinder packaging has featured a blonde-haired, blue-eyed boy. But in a marketing campaign ahead of the Euro 2016 football tournament, Kinder has started to use photographs of the German team's players when they were children. The two that the Pegida group complained about were Ilkay Guendogan and Jerome Boateng, both German nationals who play in the Bundesliga as well as the national team. Seemingly without realising this, the group's admin wrote: "They'll stop at nothing. Can you really buy these? Or is it a joke?" One commenter responded: "Do the Turks and other countries use pictures of German children on their sweets or groceries? Surely not." Soon the comments filled with explanations of the marketing campaign, and a backlash against the Pegida group. One person wrote: "Close the borders and have no exports, no migration! Then you'll get unemployment and local league football." Another wrote: "If one of those men scores a goal he'll be celebrated." The negative reaction forced the original poster to write that it was "best not to respond" and that they had "really dived into a wasps' nest." After being alerted to the ongoing discussion on Facebook, Kinder's manufacturers Ferrero wrote: "We would like to explicitly distance ourselves from every kind of xenophobia and discrimination. We do not accept or tolerate these in our Facebook communities either."